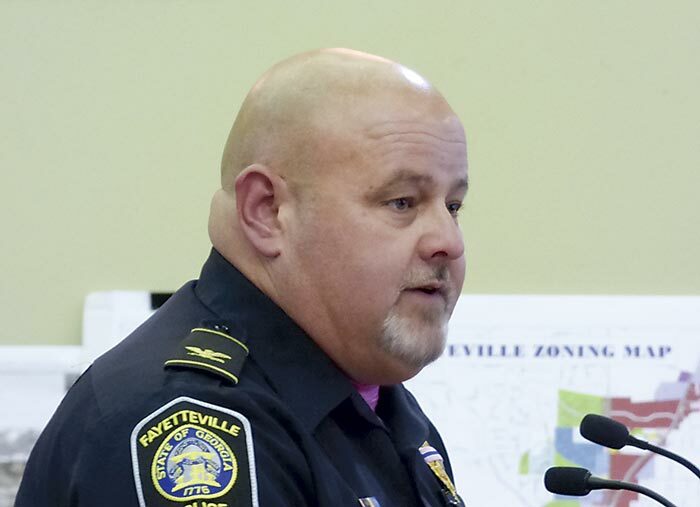 Fayetteville Police Chief Scott Gray. Photo/Ben Nelms. The Fayetteville Police Department is looking to replace old and outdated body, patrol unit and interview room cameras with a system that provides what’s described as a total solution for law enforcement evidence needs. The matter of obtaining a new camera package was on the agenda of the Oct. 4 non-voting work session of the Fayetteville City Council. With the preferred bid coming in at $499,000 over five years, Chief Scott Gray (photo above) said the bid by Pro Logic ITS would include replacement of approximately 42 body cameras, 38 patrol unit cameras and two interview room cameras and would provide the best total solution for video evidence. Gray said the department received six bids with three of those meeting the specified requirements. Of those, Pro Logic ITS was the only bidder to replace all body cameras with new units every 18 months, with the department retaining ownership of the used cameras. Scott noted the current body cameras worn by officers are 1st generation units, adding that the company providing service to the units is no longer in business. Scott said a large cost associated with camera systems is data storage, with on-site storage requiring= substantial server space and IT staff. The Pro Logic system would include cloud storage at $45,000 per year. That compares to the $70,000 per year fee for the two other bidders, he said. Integrating all cameras into one system is another advantage of going with Pro Logic, said Gray. The council is expected to take up the matter at the Oct. 18 meeting. In other action, Fayetteville annexation policy may change if city staff gets approval from council. Staff seeks to move to 2-step process, like Peachtree City. The idea was presented by City Planner LaShawn Gardiner as a non-voting workshop item at the Oct. 4 meeting of the Fayetteville City Council. Under the current process, city staff meet with the rezoning applicant to discuss the potential feasibility and secures an application which, if feasible, is submitted to planning department for review. Gardiner said the county is then notified and has 30 days to object. Minus an objection, the proposal can move forward through the city process. Given that some recent annexation requests have been contentious between cities and the county, “The county and its incorporated cities have been discussing the possibility of drafting an annexation growth development plan that would alleviate some of the issues and questions that arise when the county receives proposed annexation requests from the cities,” Gardiner said in an Oct. 4 letter. City planning staff are proposing a two-step annexation like the one used in Peachtree City. The council is expected to vote on the new process at the Oct. 18 meeting. Step One of the process requires the applicant to complete the Step One application and the required documentation, including a narrative. Once reviewed by staff, the proposed annexation will go before the City Council for review. If viewed favorably, the proposal can proceed to Step 2, Gardiner said. Step Two requires a separate application that includes the original filing and additional required supporting documentation. If determined by staff to be complete, the annexation request will go before the Planning and Zoning Commission for consideration, said Gardiner.